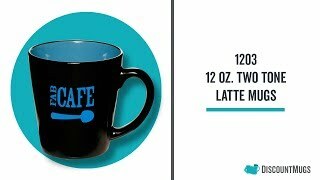 Ideal for a number of your promotional occasions, these personalized latte mugs eature uniquely shaped two tone black matte exterior with glossy colored interior walls available in shades that include orange, white, green, yellow, red, blue and brown. Customizable with your logo and brand name, these custom latte mugs hold up to 12oz of your favorite drinks, display a smooth molded ceramic composite blend and high curved handle for easy grip. Great for coffee shops, bistros and more, these printed latte mugs are certain to be a hit among already established and prospect clients. Get started customizing your personalized latte mugs today. Simply download the template unique to our items of choice and place your custom artwork within the imprint area of the design. Upload to our site with all files containing your artwork and ensure a rapid turnaround on your order of custom printed latte mugs. Orders missing information will result in further delays. Contact our customer service agents should you have question regarding the quality of our wholesale mugs, or need helps with the customization process; we are always glad to help. I am thrilled with the results of my mugs! They took a little longer to deliver than expected due to the intricate design request, but they look better than I even expected. I will definitely order from Discount Mugs again. These mugs came out great. Good sizing of the print, although it would have been better if the print size was bigger. We ordered 45 mugs and all but 1 (tiny chip) came in mint condition!The logo colors on the mugs came out perfectly, and the mugs are sturdy. I spoke with a representative, Maria, who helped with placing the order. I will certainly use DiscountMugs again! Great customer service! I had *so many* questions since I was ordering for work, but the rep I was connected to, Anna L., was extremely helpful! She professionally answered all my questions. I ordered 72 mugs and one of them got chipped in the shipping process, and Anna got me a refund for the one mug and was nice enough to give me a $15 in-store credit. As soon as I get another request from my boss for company swag, I plan on using Discount Mugs (^_^) Reasonable prices and excellent customer service!! !